Thanks so much to Lisa W. Tetting for this nomination! As a successful author and a fellow blogger, she is quite inspirational as she represents where I hope to some day be. Go check out her blog (and buy her book)! I’m sure you’ll enjoy it. Here are the five rules: (1) Thank the blogger who nominated you and link back to her site; (2) Put the award logo on your blog; (3) Answer the ten questions sent to you; (4) Make up ten new questions for your nominees to answer; and (5) Nominate ten blogs. Name your favorite character from a book? Janie from Their Eyes were Watching God is one of my favorite characters. I identify with her non-conformist attitude and her life story, which is also quite similar to Zora Neale Hurston’s. Do you prefer cds or vinyl? Eek! I prefer streaming and downloading now. This just happened around 2012…and now I’m all in. Coffee or tea? Coffee – only one cup per day, right in the morning after I’ve worked out and while I’m doing work. Where is your favorite place to write? I really don’t have a preference. In fact, I’ve recently written a draft while riding the Japanese rail system. I’ve found that words kinda come to me and usually I have to stop what I’m doing (if I can) and get it down. Name 5 places you want to visit, but haven’t had the chance? When did you fall in love for the first time? My senior year of high school I met the first person that I actually felt as if I really loved. His name was Jeffrey and we spent a lot of time together. Our relationship was a great lesson in what the actual cycle of love can be. Do you prefer the beach or the mountains? Beach! I love the beach and the water. In fact, I have a few beach pics on my blog. What is your favorite holiday? Thanksgiving because it’s not about gifts or anything. It’s about being grateful and eating, two things I love to do lol. Christmas is a close second but mostly because of the movies. I love Christmas movies. What place on earth brings you the most joy? The beach brings me the most joy because I think it represents life. Water can be calming, but it can also be dangerous. It can fade away. It can grow. It’s required to live. Do you have any pets, and if so, how did your pet come to be a part of your life? Do you have a spouse or significant other, and if so, how does this person complement you? Have you ever won any writing awards? I love Thanksgiving too. It’s all about food, family and gratitude for what you have. What a perfect reason to celebrate. I’m warming up to those blogging awards, especially with cool names like these. Kwoted has been rightfully nominated, she’s a wonderful and intelligent writer. Go check her out! Thanks for the nomination ☺️ I’m excited to be apart of the sisterhood! Wow! Thank you so much for the nomination! I’m right in the middle of an essay at the moment. But when I have the time I will look into taking part. You’re welcome! I look forward to it. Thanks for the nomination, Kwoted! 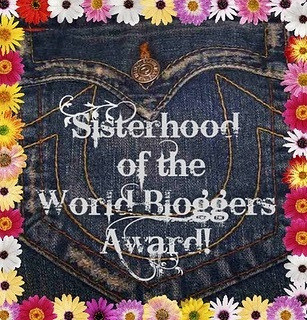 I’d love to be part of the Blogging Sisterhood! You’re welcome Irene! I think this is the coolest one yet!